make one! I used a coffee can for the house and a pringles can for the outhouse seen here. 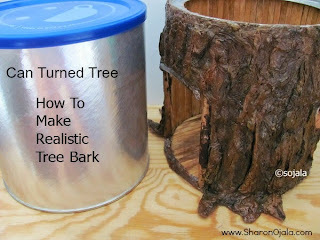 I made a video tutorial that will walk you through all the steps I took to make the bark for both of these. See below for the materials list I used. I added lots of texture for my trees but you could make it smoother. I also chose to make a brown tree but you could really make it any color you'd like. To get some ideas just google "tree trunk color" and click on images. You could also add vines, moss or mushrooms to your tree. Go crazy and have fun!! 8) let dry overnight. Drying time depends on how much or little texture you made. 11) using the other acrylic colors highlight some areas of the bark and also darken up some areas of the bark and let dry. I highlighted the protruding areas and darkened up the areas inside the crevices. 12) paint over any areas you feel needs it, highlight more ares or add in more shadow if it needs it. I did many layers of paint on my tree but that is all preference really. It's all up to you how the tree will look. 14) cut away the wax paper.. cut carefully around any roots you added but don't pull the wax paper away from underneath the roots. You will find that the thicker ares of the roots will still be damp inside. 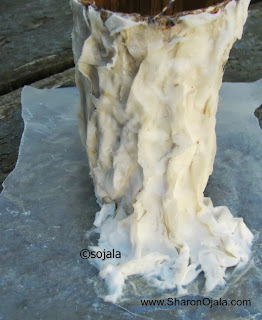 Wait a few more days then slit the wax paper open to let the air in. Thanks for sharing it looks fantastic! Sharon, thank you for generously sharing with us your wonderful tutorial. You have a great voice ! :) And what a great idea using a lazy susan *cough while working :). I have one but I hardly use it. Your tree house is awesome because the bark you made is very realistic. Great job! Excellent tutorial! This is similar to how I create papier-mache animal sculptures. Never thought about making fairy tree houses before. Your creations are adorable! Thanks for the great inspiration! Any info on the inside of the fairy house yet? My granddaughter is going to love this. Thank you so much for sharing your talents. I did a photo tour of my other coffee can dollhouse. The exterior of that one is done differently than this one but the cans are the same size. Look in my label list on the right side of this page, you'll have to scroll up and click on coffee can dollhouse. Thanks for asking! When will you show how to to do the inside? I am so excited about this. UPDATE! Today is January 6th 2014 and I am right now part way through the filming of this tutorial, it should be up on youtube by the end of the day. I'm in Canada so the end of my day, lol it's almost 1pm PST. sorry for the delay, life kinda gets in my way sometimes! can you put them outside ? This looks amazing Sharon. Just watched the tutorial. I'm interested in making a full size tree in my daughter's room. I'm curious how strong is the bark? Would it hold up to kids or is it fragile? It looks pretty sturdy. Thanks for showing us how to make it. Thank you Jared. It is pretty sturdy for normal wear and tear but I don't think it would hold up to rough play. I couldn't say for certain but if the bark wasn't so thick and you put on a top coat, like a sealer of some sort? The best to do is try a sample and see how it holds up. Hope that helps! Oh thank you so much, your comment just made my whole day! I'm so glad you found the tutorial and that it will be helpful.. all the best to you and your friend's upcoming bridal shower!! I am curious, is the felt or burlap necessary? I have a cardboard oatmeal cylinder container. Are you working with a metal can? 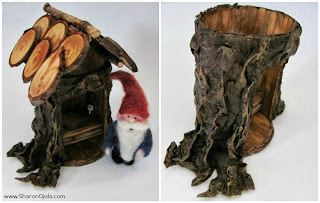 Very nice looks realistic, im planning to make a book shelves with bark on the outside. the grade 1 pupils will surely like this, thank you very much maam for sharing your talent. God Bless. Wow! This is so awesome and unique! I haven't seen anything else like this, and I admit I spend a lot of time looking up crafty projects. I love this! Thanks!! Loved the idea, need it for my own personal homemade projects right click, No copy, no problem There's more than one way to skin a cat and I did. my apologies.. I had forgotten I had right click disabled. I just removed it. Could I use this process to cover a lampshade or would the heat from the lightbulb create a fire hazzard? sorry, I wouldn't know, I've never tried that. Truly awesome!! Thanks so much for sharing...I am definitely going to try this someday...hopefully with my grandkids!! Stay Blessed!! Very creative. Thank you so much for taking the time to share your talent and expertise with us. A word of caution however if you plan to use Linseed oil. It is extremely dangerous. Please check out this link first. Thank you so much for your amazing tutorial. I love it. Do you know if the bark will tolerate being outdoors? that I don't know for sure since I've never tried it. I think if you used a sealer, one for exterior, and sealed every inch it would be good outside. Maybe talk to somebody at a hardware store, they'd know better what to do and what to use. Can you advise what I could use to make this waterproof for outside weather conditions please? THANKS! I'm making a Gnome & Mushroom garden and wanted some tree trunks to set my Gnomes on. I made one from plaster of paris but it just wasnt what I wanted it to look like. THIS IS PERFECT. Thank You! I'm making a cardboard tree sculpture for my 3-d design class. My faux painting skills aren't all that. This will help so much! I love your creative mind and your willingness to share. It takes time and effort to share your creative ideas, know it is appreciated. I want to try this!